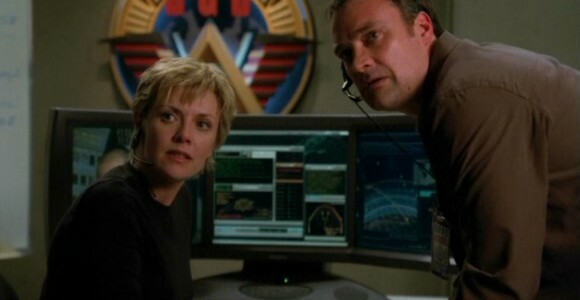 Walking through Stargate Command with Major Samantha Carter, Dr. McKay berates Anubis for his melodramatic performance in threatening Earth with destruction. But the fact remains: the steady stream of radiation coming through the Stargate from the Goa’uld’s powerful new weapon is building up, and the gate will explode in just 54 hours — wiping out all life on Earth. Major Carter and Dr. McKay bicker about how to proceed, but it’s McKay who can offer a possible solution to General Hammond: direct a massive electromagnetic pulse at the Stargate. Since that type of radiation (like radio signals) can travel backwards through an incoming wormhole, it might knock out Anubis’ weapon. Sam doubts it’ll work, but they try it anyway. The plan does fail, knocking out power at the S.G.C. for a short time. When Carter rushes to close the iris after the attempt fails, she’s knocked unconscious by a jolt of electricity. Meanwhile, Teal’c, Bra’tac and a Jaffa named Shaq’rel prepare to go into battle against Anubis’ forces, in an attempt to knock out the weapon the Goa’uld is using against Earth. As Anubis still controls only a handful of worlds, Bra’tac manages to find a likely candidate for the origin of the attack. He cannot establish a wormhole with the planet’s Stargate, as it is currently connected to Earth. Teal’c’s son Rya’c has been trained by Bra’tac, and asks to join them. Teal’c agrees, but tells him to stay on board the cargo ship piloted by Shaq’rel when they arrive at Anubis’ heavily-guarded planet. But when the ship comes under attack, Teal’c allows Rya’c to transport to the service with himself and Bra’tac. A fire-fight ensues when they arrive, and Rya’c is shot with a staff weapon. They overcome Anubis’ Jaffa and hide; Rya’c’s larval Goa’uld symbiote will eventually heal his injury. They find the weapon, and Teal’c recognizes it as being technology of the Ancients — the mysterious race that built the Stargate network millennia ago. If they can destroy the weapon, Anubis should not be able to quickly repair it. Teal’c and Bra’tac leave Rya’c behind and attempt to infiltrate the shield protecting the massive device, but the two are caught by Anubis’ forces. On Earth, McKay is apologetic to Carter as she wakes up in the infirmary. But the crisis remains, and the two can find no solution — and McKay’s plan, by opening the iris for a few minutes, cut their time remaining in half. When she finds a potential way to save the planet, Carter’s plan actually comes from Jonas — who wonders aloud how the Stargate got 28 levels below the surface of the mountain to begin with. The Stargate is removed from the S.G.C., hoisted up the long missile silo by a crane, and taken to be mounted beneath the X-302 spacecraft. Colonel O’Neill will pilot the dangerous mission, in an attempt to fly the gate far enough away from Earth that the planet will be safe from the massive explosion. But the gate weights 64,000 pounds, and there’s no guarantee that the ship can even escape the atmosphere. In fact, it can’t. O’Neill is forced to ignite the main rocket engine too soon, and does not have enough fuel to escape the planet’s gravity. The X-302 begins to fall back toward the planet, and will impact the European coastline in a little over 30 minutes. McKay suggests taking it into a nose-dive into the Atlantic, hoping that the ship can get far enough under water to minimize the fall-out from the explosion. But O’Neill has another idea: use the ship’s hyperdrive to send the ship away from Earth. They override the protocols that made the ship veer off from the unstable wormhole before (“Redemption, Part 1”), and Jack ejects as the ship enters hyperspace for only a brief second. It’s enough to get the ship millions of miles from Earth, where the Stargate explodes in a huge fireball. O’Neill is rescued, and the planet is saved. On Anubis’ planet, Rya’c manages to steal a death glider. He frees Teal’c and Bra’tac as a Jaffa patrol moves them to a new location, then proceeds to fire at the powerful weapon that has just disengaged from Earth. He manages to destroy it, but is pursued by Anubis’ gliders. There is an explosion, and Teal’c does not know whether his son is alive or dead. Back on Earth, the S.G.C. prepares to shut down its operations. The Stargate has been destroyed, and they cannot risk using Earth’s other gate so long as Anubis still has his weapon. They’re stunned when Teal’c and his friends approach in the cargo ship, announcing that Anubis’ weapon has been destroyed — thanks to Rya’c, who has survived his first battle and shown himself to be a true Jaffa warrior. To reopen the S.G.C., the United States purchases Earth’s other Stargate from Russia. Sam says goodbye to McKay, showing him that she no longer hates him by giving him a kiss on the cheek. Jonas approaches Colonel O’Neill, telling him that he feels responsible for what happened to Daniel — it should have been him jumping through that glass and giving his life to save his world (“Meridian”). He asks that he be given an opportunity to join SG-1, to carry on Jackson’s work and to try and make a difference. O’Neill is unresponsive. But when Jack learns from Hammond that the Russians will be allowed to place an officer on SG-1 as part of the deal for the other gate, O’Neill makes a counter-proposal: he’s already chosen Jonas Quinn as their new team member. The Russians can have their own unit — they’ll be happy with that. “Looking back, this was the episode that cemented David Hewlett as a favorite guest star — so favored, in fact, that years later, when we were trying to cast the part of a medical doctor for the new spin-off, Atlantis, he immediately came to mind and Brad and Robert decided: ‘Screw that! Let’s put McKay on the team!’ And the rest, as they say, is history. VOTE! How would you rate SG-1's "Redemption, Part 2?"